There are some secrets to canning applesauce successfully, and these I share with you today. First of all, not all apples are equal. There are some that make great sauces, and others that don't. I like using a variety of apples in my applesauce, as I believe only using one variety doesn't give you that lovely complexity in taste that you are after. You can see some of the best apple varieties for making sauce below, which I recommend. In addition, making applesauce also involves the decision on whether to steam or boil, peel or not peel add spices, or any additional sugar. What you choose to do, will affect the end product. But I think that the best canning applesauce recipes are ones where the skins are left on. This gives you an amazingly delicious sauce, and really does make a difference to the taste. 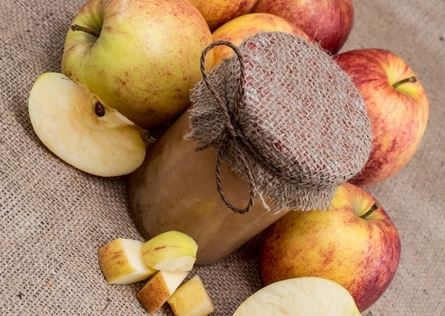 Which Apple Varities make the Best Applesauce when Canning? The late fall and winter apple varieties are usually slightly acid, and they keep their flavor better than the sweeter varieties. But keep an eye out for the following apples that make good applesauce in no particular order; Idared and Jonathan which I grow for canning, Beacon, Cortland, Lodi, Baldwin, Greening, McIntosh, Russets, Greening, Newton Pipin, Winesap, Wealthy, Northern Spy, Rhode Island and Yellow transparent. When canning applesauce, use apple varieties that have a soft to semi-firm texture, are juicy and relatively sweet. Hard, very tart apples do not make good applesauce. Do not use green, immature or early apples. Use apples that are mature, semifirm, but not overripe. You can used bruised apples, as long as you cut out the bruised area. Avoid any apples that have a wrinkled skin. 6-9 medium apples will weigh about 2 -3 pounds. This will make 1 quart of applesauce. If you use 10 lbs of apples, you will end up with 4 quarts of applesauce. 1 bushel of apples is 48 lbs, which will make 15-18 quarts of applesauce. That's a lot of applesauce! Some people don't like adding spices to their applesauce, but I can't think how you would not want to add spices, giving your applesauce a whole new dimension in taste. I like using cinnamon, allspice and occasionally some nutmeg, but mostly cinnamon and allspice. You can also use either spice on its own. Some also like cloves. Personally, I find the taste a little strong for my liking. And now we come to canning applesauce and sugar. Apples are generally tart in taste, that is why they make such great sauce, but there are some who insist on adding sugar to their sauces. I am against sugar for a number of health reasons, but, if you are hell-bent on adding sugar to your applesauce, then do so when the apples are softening in the saucepan and add just enough sugar to take the edge off the tartness. You don't need so much sugar that that is all you taste, rather than the apples themselves. A guideline is using 1 tablespoon of sugar for every pound of apples. Only use unblemished, medium-sized apples. Peel, core and cut into 1/4 inch slices. Place in some water that has a teaspoon or two of cider vinegar added to it. This stops your apples from browning. If you don't have cider vinegar, you can add a large squeeze of lemon juice. Drain, and place in a saucepan with a little water added. You don't want too much or else, the taste will be diluted, on the other hand you don't want too little that you end up scorching your fruit. About 1/2 cup per quart of sliced apples is enough. Cook until soft, and put it through a food mill or food processor for a really smooth apple sauce, or mash with a fork or potato masher. At this stage, taste your applesauce and see if you want to add some more cinnamon or allspice, or sugar if you are using it. If you wanted to, in order to futher intesify the apple flavors you can use apple juice instead of water. To me, adding the apple juice is a win-win situation. Not only do you end up with more flavor in your applesauce, you also add a little bit of natural sugar which will take the edge of the tartness, without resorting to using white sugar. Put the applesauce back onto the heat and bring it to the boil. Ladle the sauce into hot, sterilized jars, leaving a 1/4 inch headspace. Place the bottles in a large saucepan that has either an upturned place or a wire cake rack on the bottom of the saucepan to stop the bottle from cracking under the intense heat from the plate. Make sure that there is enough water between each bottle. Cover the bottles with boiling water until there is an inch of water over the bottles. Bring the water back to the boil and start the timing once the water is at a rolling boil. Process 10 minutes for half-pints, 15 minutes for pints and 20 minutes for quarts. This is my favorite applesauce recipe, not only because it is a quick and easy to make, but because by leaving the skins on, I think it gives the sauce a much superior flavor. I use it when processing my own apples because they are grown organically and never sprayed with any toxic insecticides. 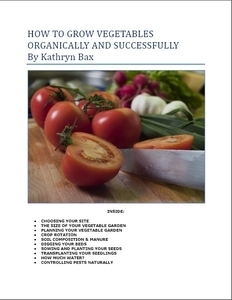 Only use this recipe if you are using fruit you have either grown organically yourself, or bought from an organic store. Core and chop up 3 lbs of apples, leaving the skins on. This gives the sauce a nice, rich color and a good flavor. Try using at least 2 if not 3 different canning apple varieties. Place the chopped apples into a saucepan along with 1/2 cup water and 2 tablespoons bottled lemon juice. Cook over a medium heat until the apples are tender, about 15 minutes. Put the apples through a food mill or mash them up. Heat up the sauce once more, adding any spices that you want to add and any sugar to taste. Once boiling, remove from the heat, ladle into hot, sterilized jars and process for 10 minutes if using half-pint jars, 15 minutes if using pint jars, and 20 minutes if using quarts. I call this the "naked applesauce recipe" because there are no additional spices, or liquids in this recipe. This is applesauce reduced to the minimum. Peel, core, and steam the apples until soft, run through a food mill or colander, return to the heat and heat thoroughly. Place hot into cans or jars, and seal at once. Process for ten minutes at 212° Fahrenheit in a hot-water bath. Peel, core and quarter 10 lbs apples. As you quarter them, place them in a bowl of water with added lemon juice to stop them from going brown. When you have finished, drain the apples and place them in a large saucepan. Add 2 quarts of sweet apple cider to the apples and bring to the boil. Cook over a medium heat until tender. Stir often to make sure that the apples are not catching at the bottom. Have your hot, sterilized jars ready. Drain off any excess cider and reserve. Process the apples into applesauce using a food mill or just mash them. You can add back a couple of tablespoons of cider if you want to thin out the sauce. Place back on the heat and bring to the boil. Remove and ladle into jars using the same processing times as the first canning applesauce recipe. I love roast pork, goose, or duck and applesauce. This is a match made in heaven. You can also pair it with rabbit. However, you can also use your applesauce for baby food, to add to your breakfast oats, plain yogurt, homemade ice cream, or add to banana muffins, cakes and breads. Your canned applesauce will last 1 calendar year.